Hardball with a twist: this 230 grain jacketed hollow point is a step up from the baseline offering of hollow points, but still offers a good mix of value and performance. 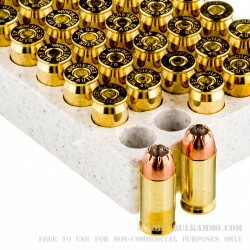 At about two thirds the price per shot of ultra-premium .45 ACP defense rounds, this load still offers compelling numbers and exceptional reliability with a good clean burning powder mix. Sure, it doesn’t boast the highest ballistic numbers, but it doesn’t have to. It’s a single round purchase for those who want to simplify. You can train with it and not feel too bad about the cost, because it’s the same cost when it’s being carried in your daily carry setup. 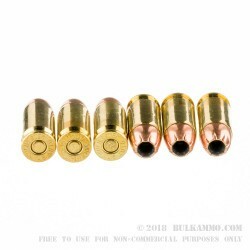 230 grains of lead core copper jacketed hollow point still means something in the shooting world. 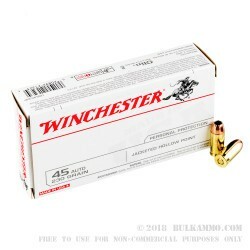 Winchester still has some of the most consistent and reliable handgun ammunition in the world too. If you want a single purchase solid performer, that doesn’t have some unproven science behind its design: this is a great consideration. The reputation and reliability factor speak to the value it holds in shooter’s peace of mind. 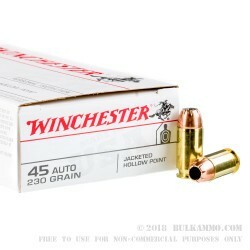 Will work in any .45ACP firearm and feeds and extracts with the highest level of reliability.